Live your faith every day and gladly proclaim it, this beauty has a vintage repousse floral embossed Cross, there are two small religious tokens: an antique medallion of the Virgin Mary and a small cross. 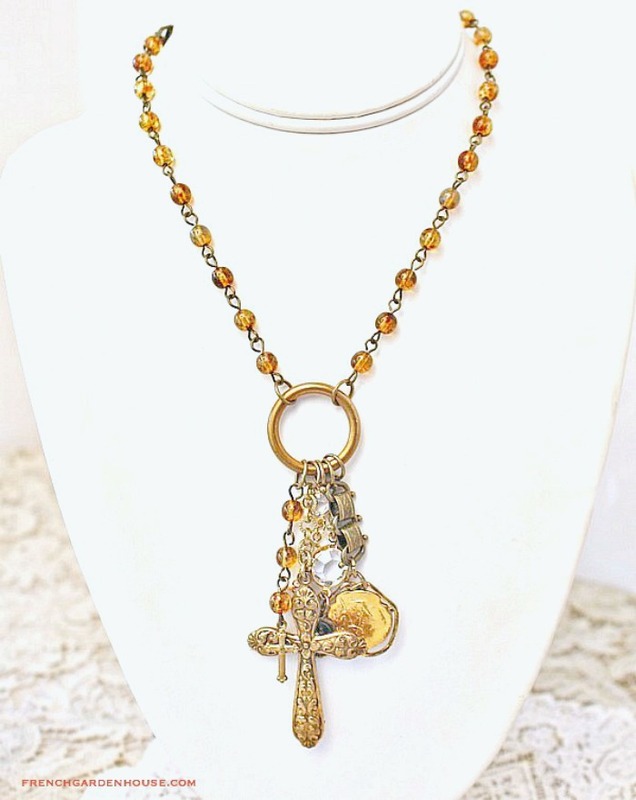 Added to them, a French medal of Joan d'Arc, Czechoslovakian Crystals and antique book chain, all hanging from luminous Tortoise Picasso beaded chain. Need I say more? A delicious designer statement necklace, sure to garner compliments at your next luncheon You can shorten the length by simply clipping the lobster clasp higher up the chain. Necklace: 20"; Repousse Cross measures 2" long.